"A Classic is something, everyone wants to see/read, but no one has read/seen." Being a movie maniac, I believe my blog should have write-ups on movies from time to time.The movie reviews will not see my funny side, as MR.X is kept out of this. Infact they would ofcourse reflect the emotions they trigger on me. The movie I selected to kickstart my review series is , " A Walk To Remember"
A brief on the story before I write my comments on the same. 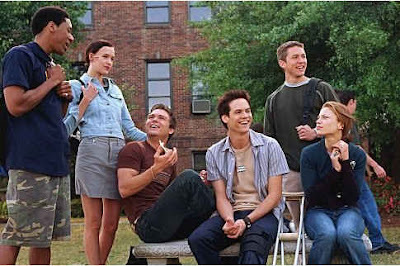 When the popular, restless Landon Carter (Shane West) is forced to participate in the school drama production he falls in love with Jamie Sullivan(Mandy Moore), the daughter of the town's minister. Jamie has a "to-do" list for her life and also a very big secret she must keep from Landon. Without any more a-do, I'll write about the emotions I went through when I saw this movie. Last week, I saw a classic that I had been planning to see it for a long long time ... “A walk to Remember”. Firstly Mandy Moore is just amazing.When ever I see a movie, I try to tell myself that, its just scenes put together & all a game with light & shadows. (An excuse not to get involved). Anyway I could relate myself to the whole story. (maybe something to do with my mood).A feeling of complete surrender which makes you totally free. L.O.V.E. Does love like this really exist? Or is it that they exist only in Books & movies? Love, so complete like the love of Robert Kincaid & Francesca?? (Bridges of Madison County). So complete that time & space really didn’t matter. Some of the scenes almost made me cry & this time I didn’t try to detach myself. I let it roll on.If such love & commitment exists, I would love to be in it. "A walk to remember.." ..
it is really glad. watch it alone, cos you would not want others to see tears in your eyes.. more over the words are very powerful and you would not want to be disturbed. Thats why i told " watch it alone"
a long time (During my school days to be precise) i remember the craze of this book and it my bad luck that i wasn't able to read this one. but i have learnt from my reliable sources (friend who were able to read this book) that its a must read. and when i listen abut the movie its too a must watch. i feel that the director has done the correct judgment to the book!! yeah.. true.. i took this movie from fazal's notepad.. I didn't even want to watch this movie because when I heard about it some time ago, it sounded retarded and too emotional. There are other movies that make me cry which would be worth my time! But I guess you do like these kind of movies...your perfect movie companion would be my sister. ps- I can't believe you're an enforcer of the stupid lefthand/righthand principle! I would understand it when you turn 40 but while we're young, it shouldn't matter if the person offering is the same age as you. and regarding the left /right hand rule, that was supposed to be a funny remark(an ode to my ad-observation skill). I even fight with my dog and eat food stuff.. I Love the movie too !! ooo u r so right! even i loved watchin this movie,,,its so touching nd the love is so pure..u know? ?